In the meantime I've decided to finish many of the unfinished projects I have on my shelves. Some just need to be quilted. Others need a border and then quilting can begin. Some are orphan blocks that will become--who knows what. But I have pattern by Claudia Clark Myers in the book Colorful Quilts and the title of the quilt is Moonshine. 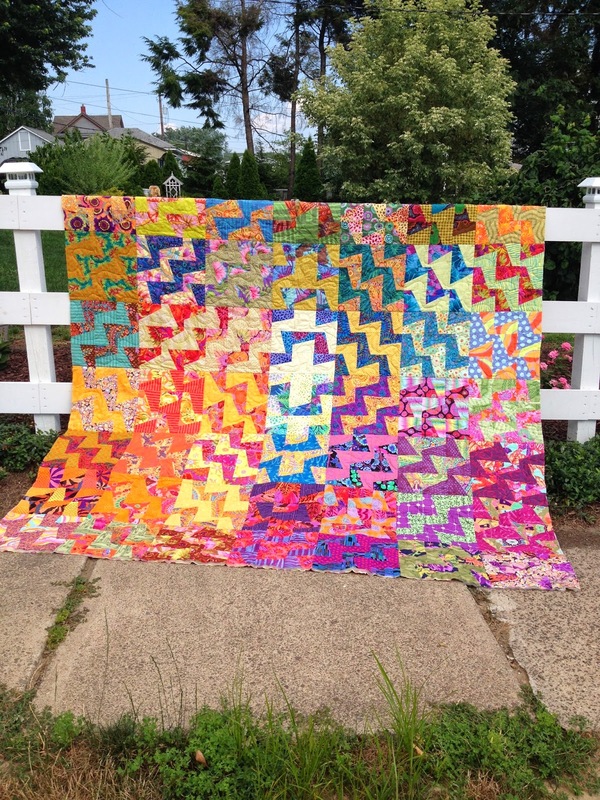 I admire every quilt she and her sometimes collaborator, Marilyn Badger, do together and here was a pattern I liked immensely. 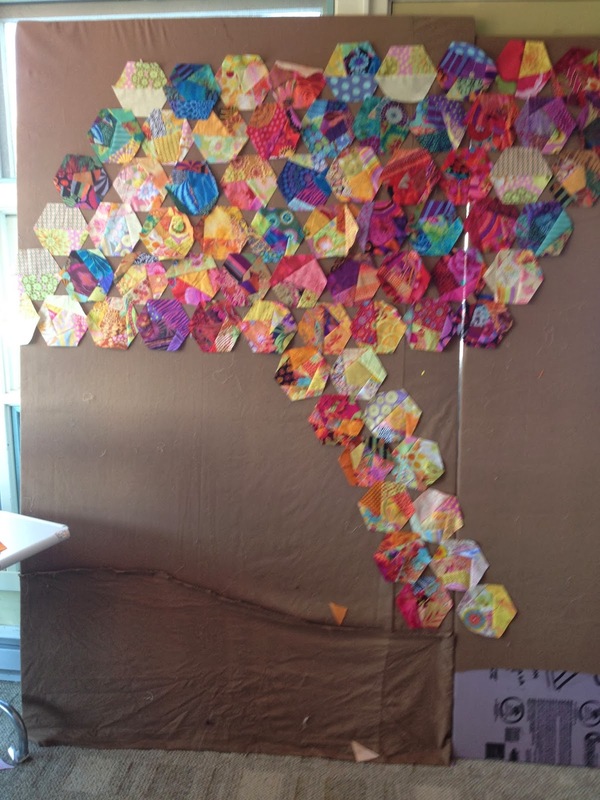 However, it is paper pieced, definitely not one of my favorite methods of construction. 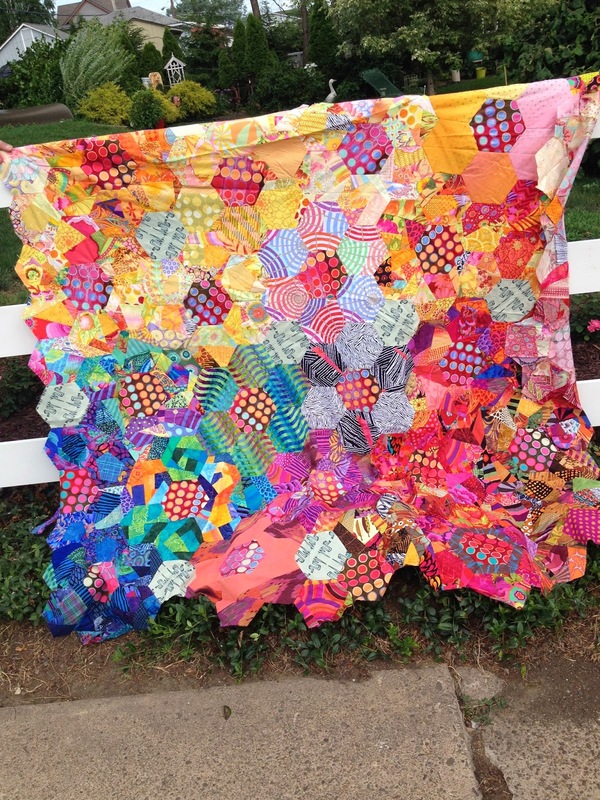 I do have a photo of the quilt from the magazine but don't feel comfortable posting it here. I have many.many more blocks done, currently enough for 8 rows down. This is a shot of some of them put together. There is a big and small side to each block. Sometime soon I'll audition them in various positions and see if I can find something pleasing. I spent a lot of time going through my fabrics to find combinations that matched hers so I'd like there to be some movement to the piece. Hers has blocks with lighter values going from the lower left to the upper right. In order to finish I would say I would at least have to make at least another 32 blocks. Remember each block has two parts. Can you see why I'm stalled doing a process I don't like, although I'm happy with the results. 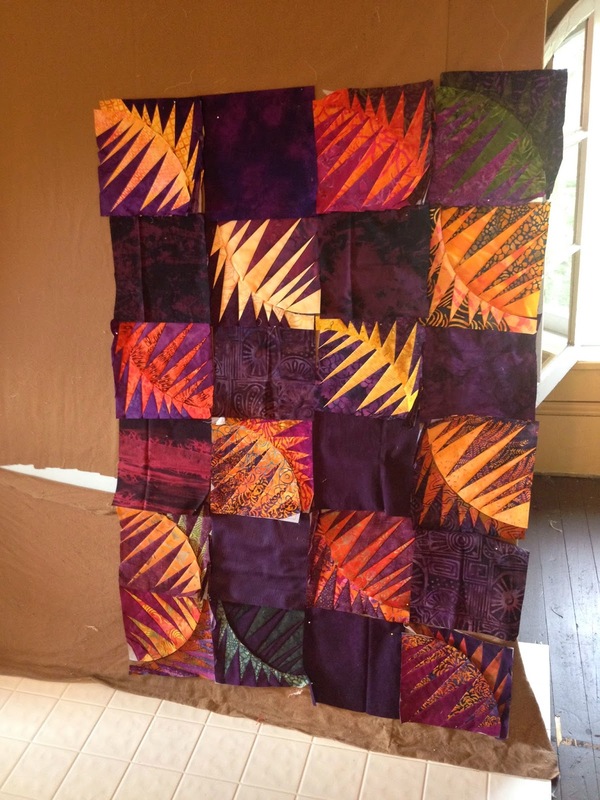 This quilt has been done for many weeks but in the original rectangular shape I'd used for its construction. 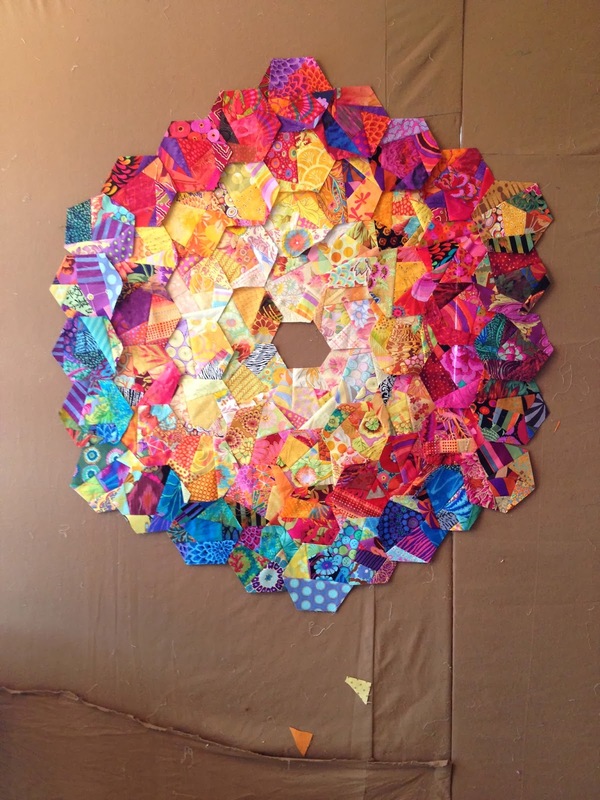 I delayed finishing it because I was uncertain whether or not to square it off and put a border, bind it with the uneven edges, or what…Then a good quilting friend suggested I make the final shape a hexagon and I immediately liked the idea. However, it was a rectangle and how to measure to make it six sides. A youtube video to the rescue. Here is is all cut. I'm standing at the side trying to avoid sun on the lens so it doesn't look quite even, but it really is. May not be a perfect hexagon I'm happy with it. I tried several orientations but I think I like this one with the yellows on the left the best. I love making quilts in which the colors move around kind of like a color wheel (though this one does not reflect the true placement of various colors. Now to decide on a quilting motif. Decisions, decisions. Well, finally I have some news to report. I've actually finished, well, almost, finished two quilts. 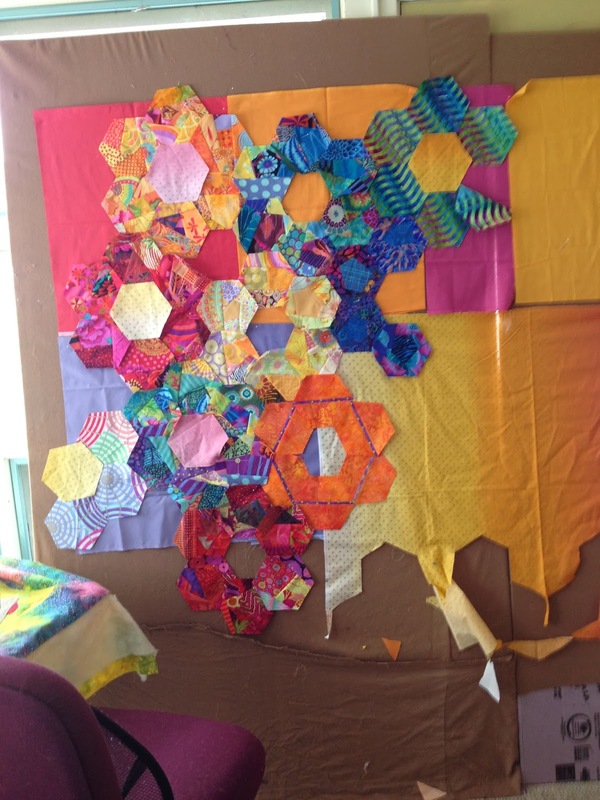 Although it doesn't seem as if I've accomplished much on my hexagon project there has been lots of behind the scenes work. For one thing I threw all my scraps on the floor and sorted them by color. No small task and my back ached for days afterward. I've found that the best way for storing them is in the large laundry type baskets with oval holes in the sides. The holes enable you to easily spy that certain fabric you're looking for. Not really but you can get a good glimpse of what's in the basket. In addition I've been auditioning settings for the hexagons. 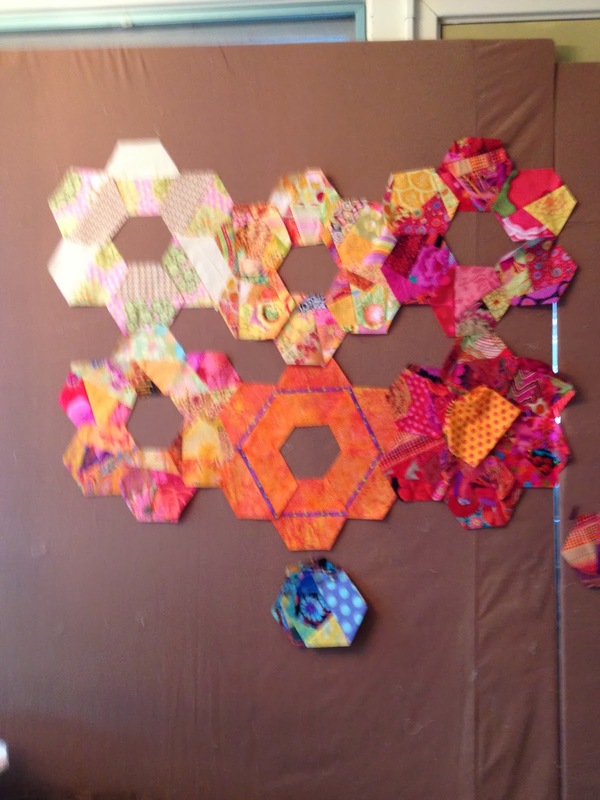 I've kind of decided on orange for the fill-in hexagons and not sure what for the centers yet. Maybe a Kaffe polkadot in various colors. That's yet to be decided. But I have settled on this arrangement, though am still rearranging the "flowers" and I have lots more to make. I enjoy making them actually and am thinking that my newly arranged scrap baskets will help speed up the process. 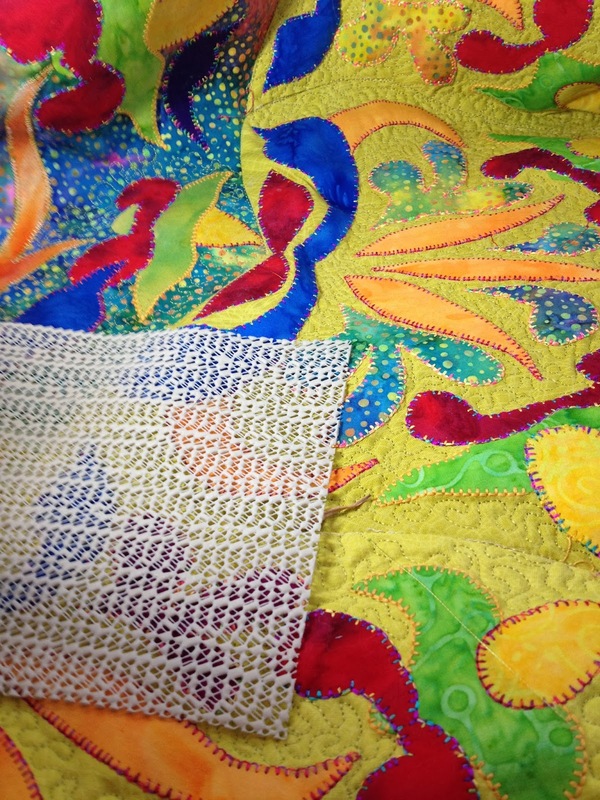 I've also been working on machine quilting my Ricky Timms Colorful Rhapsody project started last summer. Hope you can see some of the stippling and blanket stitch outlining the appliquéd piece. Ricky instructions have you use Steam a seam for fusing and then a stabilizer for support when doing the blanket stitch. This stabilizer then has to be removed. Very annoying and time consuming. I tried heavily--and I mean heavily--starching one area before blanket stitching and it worked just fine. Will do that in the future. Also the little pad you see in the photo is what I use to guide the quilt for the machine quilting. This is what Philippa Naylor uses in making her award winning quilts and I'm a dedicated follower of using them. It's really just shelf liner. I use one under my left hand and one under my right hand. I never did like the gloves suggested or any other project promoted for quailing. These work just fine and if you loose one you can just cut another piece off the roll. Voila! Which is better? this or this? Just went for my annual eye exam. And you know that dreaded "which is clearer, this or this?" and basically you can't see a bit of difference? Well, I'm giving you a choice but there more than two options. I've been continuing to make more hexagons, basically six at a time but trying to stick to a color for each set of six. So far I've done four arrangements on my design wall. The circular one is my latest attempt. I like the way the colors flow from lightest in the center to darker on the outside. But I think I'm losing the hexagon effect. Maybe that's not so important but I would like to showcase the idea that they are hexagons. Would I be better off to separate them with little setting triangles? Take a look at the post from a few days ago and compare the photos with this one. 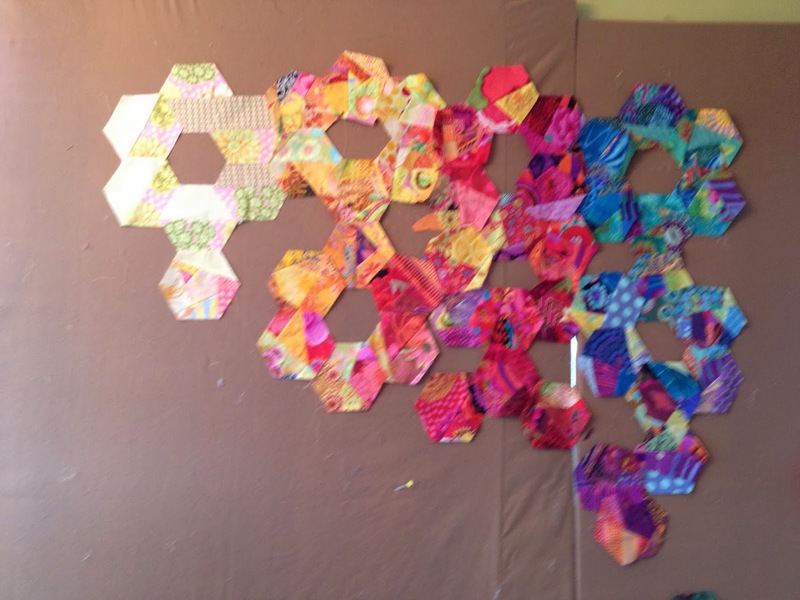 I'm giving you something to think about today and hopefully by tomorrow I will have separated them with fabric between each hexagon. That's the plan anyway. By tomorrow you'll be able to consider, which is clearer, number 3 or number 4?